I've mentioned on the blog in the past that I go to the Texas Renaissance Festival every year, and occasionally make a trip up to the Dallas-Fort Worth area to Scarborough Faire, but this past weekend I visited the Sherwood Forest Faire that opened near Austin just last year. And for a faire only in its second year, I was pretty impressed with what they've accomplished already. And it was really nice to visit a faire that only required about a 30 minute car ride, as opposed to 2 to 3 hours! I think it is a common staple of faires to have a Royal Mint where they do demonstrations and/or make custom coins and medallions, and this faire was no exception. 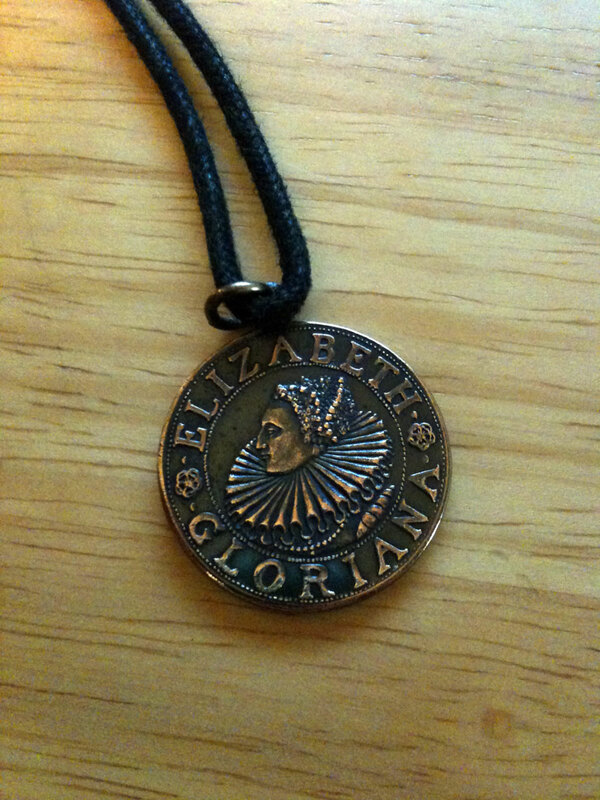 I was just casually glancing through the available designs to have struck into a medallion when a familiar face caught my eye - Elizabeth I! 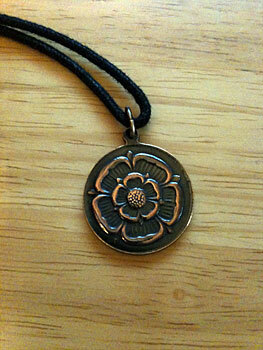 I then noticed the Tudor rose design and decided I had to have one made. I opted for the bronze with antique patina (they dip it in sulfuric acid and then polish) and you can see the final product below. I'm still sorting through the 250 pictures I took (we had really good seats for the falconry show, so I snapped a lot of pics - I love digital cameras!) and I'll tweet out a link when I get them all uploaded to my Flickr account. Updated 4-03-11: Flickr set is now up here! I am writing a work about The Tudors and The Kennedys to explore how each dynasty influenced on their countries and what are the common point between them - I found out a lot of similarities between JFK and Henry VIII, just sayin'. Can you help me with your opinion or reading my essay? Thanks, anyway. Hmmm, that's an interesting idea. I'm afraid I don't have a whole lot to add though since I don't know a whole lot about JFK beyond the basics of his presidency. You might want to submit a question to my Tudor Q&A blog though, to solicit other opinions/ideas!